P1: John Carter strikes the Martian who attempts to bully him -- the powerful blow kills Drogar. P2: Tars Tarkas indicates that Carter has won the rank and possessions of Drogar. "Some Martian tailor will have a job here," Carter laughs. P3: A month passes -- "He is an apt pupil, Tars Tarkas. He has learned our language quickly. Already he reads the books left here by the ancients." [says Sola] "Sola is a patient teacher," Carter replies modestly. P4: One day an airship passes above the ancient city. Tars Tarkas shouts quick commands to his men. P5: Crippled by a withering hail of deadly bullets, the ship spins down out of control. P6: The Martian savages race out to finish the survivors and loot the wrecked craft. P7: [Carter reaches one of the wounded survivors from the downed airship] "You are like earth people!" Carter exclaims. The dying man groans,"The Princess -- save -- her -- from -- these -- Tharks!" P8: Now Carter beholds a lovely girl struggling vainly against her giant captors. 2. The Sunday strip has Carter learning Barsoomian language and customs with the aid of a library of ancient books and the tutelage of Tars Tarkas' daughter, Sola. The location of his education is merely given as "the ancient city." Some reconciling of these two differing education accounts can be made in the strip novelization narrative. His rapid learning of the language may be attributed to two reasons -- 1. Carter, and ageless, ancient warrior, has learned many new languages in his extended lifetime and has become an expert in that process -- 2. Carter gets a good deal of help in his learning through his being able to read the minds of the telepathic Martians. 3. 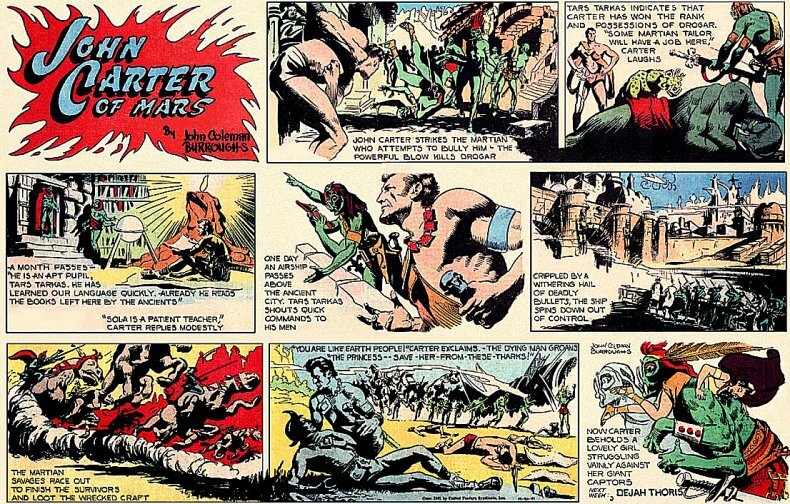 In Sunday strip #3 John Carter receives his Martian necklace, swords and weapons harness. These are evidently retailored to fit his smaller size and he thenceforth wears the same apparatus throughout the remainder of the story. 4. The Sunday strip and the comicbook versions of the story both introduce firearms among the green Martians with no explanation of where they cpme from. Some explanation of how these weapons are designed and manufactured should be offered in the novelization. The Sunday strip story calls the Heliumite flyer "an airship," giving no reason why it is traveling the skies over the Tharks. The comicbook version shows "a great fleet of rocket merchant ships," of which, evidently, only "the flagship" is shot down. The physical description and purpose of Dejah Thoris' flyer needs to be clearly delineated in the novelization. The ERB story has her as a primary official in a scientific expedition, sent out from Helium. Since the novelization is told from the perspective of Dejah Thoris, considerable detail should be provided in relating how and why she was in a flyer susceptible of being short down by the Tharks, what her personal experience was during the attack, etc. CHAPTER 3: "THE FAIR CAPTIVE"
The small fleet of Heliumite airships had already conducted much research in the upper atmosphere of the northern hemisphere. The expedition gathered thousands of containers filled with air samples, as well as stacks of completed notebooks, numerous temperature and pressure recordings and new charts of the Barsoomian air currents, all of which were of priceless value to the scientists and navy of the empire. But an equal number of samples and readings had to taken at much lower altitudes. Dejah Thoris listened attentively as the commanding admiral addressed an assembly aboard the flagship on this very subject. "We will begin our low level survey at a point between the cities of Ptarth and Zodanga. As we come closer to Zodanga I expect the utmost vigilance of all personnel, for the likelihood of war is undeniable. The fleet will rendezvous for a transfer of supplies and equipment over the ruins of Korad. Scouts tell us that the place is deserted and entirely safe..."
Captain John Carter is a mysterious man of many lifetimes. This is not the place to recite his memories of centuries gone by, but that fact explans why he is also a man of many languages. He very quickly learned enough of the common language on Mars to suffice for his daily needs. Shortly after his initial contact with the green men the Virginian found that nearly always could guess the correct Martian terms for objects and sometimes also for personal names, titles and actions. It eventually struck him that he was sensing the very thoughts of the green giants. Although every Martian is hatched with telepathic abilities, the Earthman had to discover and develop the talent entirely on his own. In the process he also learned how to keep his personal throughts secret -- an exceptionally rare mental gift on the red planet. He learned that "sak" means jump; that a "drogar" is a crack marksman and "gorthan-jur!" is a warning of impending murder. Put together, the words translated to something like "Jump, or this gunslinger will ring your neck!" Having figured out that Dotar Laj the drogar had truly threatened his life in the plaza, Carter next learned that the ruffian died from the blow to his chin. "Why?" John Carter asked, when Tars Tarkas handed him two bundles, which proved to be the arms, ornaments, and the full accouterments of a green warrior. "Dotar" and "dead" were the only intelligible words in Tars Tarkas' fast flowing reply, but from that the captive realized that he had inherited the dead drogar's leather body harness, woolen cape, swords, pistol and sandals, as well as a scanty wisp of an animal hair loinclout. Tars Tarkas had the cape cut into three warm mantles for Carter's used during the freezing Martian nights. The same tailoress, a young green female attached to the retinue of the green leaders, also remodeled the dead man's other trappings to fit the white man's lesser proportions. Much happened to John Carter at Korad, the place of his first residence on Mars. What can be said in summary is that Sola, the girl sent by Tars Tarkas, instructed him in the language and customs of her people, the semi-nomadic Tharks of Barsoom's southern deserts. Besides learning the every day vocabulary of the Tharks, he also questioned his teacher and others in order to pick up the more complex Martian figures of speech. Sola revealed that the ruined city of Korad had been built by small, highly evolved beings, but not until he stumbled upon a few ancient reams of illustrated text did Carter know for certain that Korad was once inhabitated by beings who looked very much like himself. One day a green rider drove his mount furiously into the ruins, yelling at the top of his voice and gesticulating wildly at the sky. The effect upon the giant nomads encamping among the buildings was phenomenal. In a few moments the entire company of Tharks was nowhere to be seen. Only a dozen or so of the lowest ranking giants remained in the streets. And once they had hidden all the group's animals, extinguished its fires, and covered every trace of recent habitaton, they too disappeared from view. Sola directed John Carter seek shelter with her behind a pile of fallen stones on a roof top. From that hidden vantage point they watched and waited. Sola pointed at the northern sky. A huge silver craft, flying low, appeared from below the horizon. Following it came several more, until twenty of the vessels sailed slowly and majestically over the broken walls of ancient Korad. John Carter watched as the strange vessels lingered, almost motionless, over the northern quarter of the ruins. A few of the smallest craft began flitting back and forth among the larger ships. As best the Earthman could determine, the small flyers were shuttling man and material back and forth between the other ships. Then without warning the green Martian warriors fired a terrific rifle volley from the windows of buildings facing the preoccupied crewmen. Some of the firearms thus employed were double the size of a normal rifle. The withering hail of missles from these big guns punched gaping holes in several of the airships and they began to spin down out of control. The broken craft did not plummet from the skies like stones; rather, they lost bouyancy over a space of several seconds and then took a full minute to reach the ground, crash and burn. In the meanwhile, the precision fire from the ground never diminished. One by one, however, a handful of the crippled ships managed to dip back below the horizon, until only one barely moving craft was left sight. This had received the brunt of the Thark fire and was drifting to the ground, seemingly unmanned. It soon became evident that she would strike the base of a building not far south of John Carter's position, and as he watched the progress of the ship's descent, he saw a number of green riders gallop out to meet the falling hulk. As the great injured craft settled in at the bottom of the building, the Tharks threw out grappling hooks, pulled it to the ground and swarmed on board. The Earthman watched them examining the dead crew, and presently a party of the green appeared from below the deck, dragging a little figure among them. The creature was considerably less than half as tall as the green Martian warriors, and Captain Carter saw that it walked erect upon two legs. While these events were transpiring the remainder of the Tharks were pouring into the streets to witness the looting of the fallen airships. Tons of salvaged material had been hauled into the plaza when the Virginian got there. Most of it consisted of hunks of twisted metal and other useless junk. But then he saw a wagon full of corpses being unloaded and stripped. He ventured forth for a closer look. "They are like Earth people!" John Carter exclaimed in English. At that moment one of the supposedly dead bodies lifted its eyeless head a little and let out a ghastly groan: The Princess -- save -- her -- from -- barbarians!" The astonshed outlander had no chance to question the poor red-skinned fellow. He was not at all sure he'd heard the expiring stranger's word's correctly, and even if he had, they might have been nothing more than that suffering soul's dying delusion.